John Campion, B.A. (Western), J.D. (Tor), FCIArb, Mediation (Harvard), Emeritus Bencher (2000-2015), Certified by the Law Society of Ontario as a Specialist in Civil Litigation, is an arbitrator and mediator with ADR Chambers. class actions (securities – Bre-X and SouthGobi, Walkerton poison water, mass tort – VIA and propane explosion, consumer protection – UPS, insurance policy interpretation – Dominion litigation and mediation). John has rendered over twenty commercial arbitration awards on substantive and procedural issues, acted as mediator or counsel in mediating contracts, family enterprise, construction and mass tort matters. He has rendered over twenty disciplinary decisions at the Law Society of Ontario. 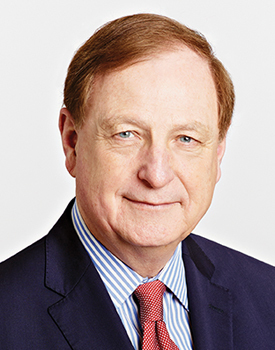 John served as elected Chair of the Firm and Chair of Litigation, and is a retired partner/lawyer at Fasken Martineau Dumoulin LLP (1972-2016). He is a Fellow of the Chartered Institute of Arbitrators (London) and a founding member of the Toronto Commercial Arbitration Society. He was President of Federation of Law Societies of Canada and the Empire Club of Canada. He was a member of Board of Directors and Chair of the Audit committee of the Canadian Broadcasting Corporation. He was an adjunct Professor of law at Toronto and Osgoode. He is co-author of Professional Liability in Canada (Carswell). He is literate in economics, financial statements, board of director governance, finance, securities, political Canada, corporate Canada and government and media relations. He has been counsel to two prime Ministers of Canada. He is nationally and internationally recognized as one of Canada’s senior trial appeal arbitration and mediation counsel.